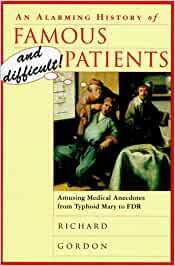 A compendium about the medical travails of famous people throughout history offers colorful anecdotes and intriguing observations about such difficult patients as Stalin, Napoleon, Adolf Hitler, and King Charles II. From the prolific author of a long string of amusing doctor books (the Doctor in the House series) and quirky medical histories, an oddball assortment of chatty, impertinent anecdotes about the afflictions of 31 well-known people, real and fictional. This time, the doctor has his fun at the expense of such political figures as Washington, Napoleon, Hitler, and Churchill; royals such as Queen Victoria and Germany's Frederick III; literary luminaries from Boswell to Proust; and assorted others, including van Gogh, Freud, and Sherlock Holmes. Aware that Washington's ownership of false teeth is a familiar story, Gordon enlarges the retelling by informing us of 18th-century dental practice-- transplants from cadavers, dentures from walrus tusks--thereby making us value dentistry's advances in recent times. The notion of medicine's progress permeates Gordon's accounts, for the treatments that 17th- and 18th-century doctors inflicted on patients-- purgatives, enemas, bleedings, cuppings, and numerous foul concoctions--now seem not merely ineffective but downright death-promoting. Perhaps even more terrifying is the idea of surgery without anesthesia; Gordon's graphic description of the operation Pepys endured for removal of bladder stones sticks in the mind. Clever and gossipy, Gordon's brief anecdotes are full of name-dropping and sexual tittle-tattle: Boswell had gonorrhea, Carlyle was impotent, Florence Nightingale was a lesbian, and Hitler had only a right testicle. It is relief to come to the last chapter, where Gordon has the most fun of all with fictional figures. Dr. Watson's letter to Freud about his neurotic friend Holmes is a gem, as is Freud's reply. Discovering the human frailties of notable men and women (Byron had sclerosis of the liver, Proust suffered from mother-fixation, Elizabeth Barrett Browning was anorexic) does little to increase appreciation of their work but certainly cuts them down to size. For the most part, this is pretty low stuff, the National Enquirer for history buffs. (24 pages b&w photos, not seen) -- Copyright ©1997, Kirkus Associates, LP. All rights reserved. This is a companion book to "The Alarming History of Medicine" by the physician, writer and humorist Richard Gordon, who also authored the "Doctor in the House" series. It contains medical commentaries on 31 more or less famous people, picked (more likely than not) for the availability of their disease records than for other communalities they may have had. Medical gossip can be a lot of fun, and Gordon exploits this subject very well, adding obscure and recondite facts to what might be common knowledge. Yes, most people know about G. Washington's dentures, but it is surprising to hear about the English fad for dental implants that resulted in "barrels full of teeth" taken from US Civil War cadavers by macabre entrepreneurs and shipped to Britain, there to be sold by mail-order. Most know vaguely about "Typhoid Mary," but the story of Mary Mallon, an Irish cook, is seldom told as the medical detective account in which Dr. Geoge Soper was able to track her down by sheer obsession, luck, and statistical skills. Many know about the divine Sarah Bernhardt's leg amputation, but here the anesthetist's notes are transcribed, and the history of her injury and treatments, before and after the removal of her right leg is recounted. Napoleon's hemorrhoids at Waterloo? Hitler's missing left testicle? Queen Victoria's abscessed armpit? Probably more than one cares to contemplate; but for the inveterate gossips and trivia collectors amongst us it is a treasure of scuttlebutt, rumor and history that will be cherished. There is no index, and for a book of this type that should cost at least one star. The fair bibliography is good enough, but it doesn't make up for the absent index. 5.0 out of 5 starsBuy It Now! This book is a winner! It is funny, informative, surprising (wait until you read about Boswell!) and written with great wit. I am not sure I am using the right word in titling this review. I read Gordon's book in less than two nights. I really enjoyed Roy Porter as a medical historian. His history was 'correct'and I learned a lot I didn't know before which is why I chose his books in the first place. Gordon had been recommended to me, but I found myself first amused by his book, then the humor and Gordon's own opinions started me questioning the accuracy of what he was writing, especially when I had read other histories of these same people, and those histories said different things than Gordon states. Is using humor in medical history right? There are reasons for wanting to know how someone who was famous lived and died. For example, Beethoven like me was deaf. He died at an earlier age, and just recently testing showed that his tissues and hair had large amounts of lead which most probably led to his death, and may have been responsible for his hearing loss. He also took the medicines that were available at the time, which often included more lead, leading to his accumulation of lead poisoning. I don't find this information particularly funny, especially when it is known that there are many children still living in homes in the US and elsewhere who are exposed to too much lead in the paints and the wallpapers used in older homes. I guess this book is appropriate for someone who wants to be entertained and not too picky about how accurate the medical history is. I quess I just don't think it is funny for people to make light of the pain of others. This isn't a book to use for education purposes...we have enough problems with our younger doctors today treating patients not as an individual but as a 'disease' or a 'case history', and I don't think I would ever encourage any of my students heading towards medical fields to make fun of the people they are treating. I had previously read Gordon's "Alarming History of Medicine" and was not too impressed but I decided to give his books another chance since I had found parts of the "alarming history" to be entertaining. I should not have tried. The book is more of a collection of off-the-cuff stories of the deaths of a few historical figures with some Fruedian cliches scattered throughout. There are even some chapters that don't really have to do with the illnesses or medical conditions of people at all (or VERY peripherally) such as the Bernard Shaw chapter. More distressingly, he repeats the "glorified" versions of some events rather than the actual events that occurred throughout the history of medicine. For example: Ignaz Semmelweiss did not ironically die of the very condition he tried to stop - sepsis from a contaminated instrument; but died suffering from dementia in an asylum, likely beaten to death by "caretakers." If you are interested in Medical History, I've reviewed a few books on the topic and laid down my feelings about each work there. I'm no expert but just an enthusiastic amateur. The "fictional" sections at the end ranged from tedious (it is impressive that a story spanning 7 pages can qualify as tedious) with the MacBeth offering to the genuinely amusing section on Sherlock Holmes. Although the best bits of that are very remeniscent of Nicholas Meyer's "The Seven Per-cent Solution."